Arvada was incorporated in 1904 and encompasses almost 40 square miles in the counties of Adams and Jefferson. Located 10 miles northwest of downtown Denver, this community has a population of over 113,000 but retains a small-town atmosphere. The community has a rich history and a robust mix of businesses among quiet, tree-lined streets. Three interstate highways make for easy access to the metropolitan area and the Denver International Airport. People come to Arvada because of its low crime rate, diverse economic base, strong civic guidance and highly educated workforce. This superb quality of life has helped turn the community into one of Colorado’s most competitive and attractive cities. Arvada falls into the Jefferson County school district and is served by 34 public schools. This includes 22 elementary, three middle, two junior, two senior and five high schools. Residents can also select from six private and four charter schools. 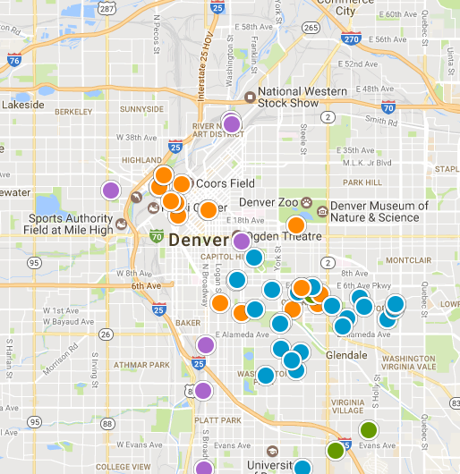 Businesses and residents have convenient access to top-notch research institutions such as the Colorado School of Mines and the University of Colorado. Additionally, the Red Rocks Community College Arvada campus offers training assistance to meet employer requirements. Arvada is home to one of the biggest multi-disciplinary cultural and art centers in the nation. The Arvada Center offers concerts, award-winning theater productions, educational classes and a large banquet facility. Recorded on the National Register of Historic Places, Olde Town Arvada delivers an eclectic dining and shopping experience. The district has a transit stop as part of the FasTracks rail system. The area has 125 miles of hiking, horseback riding and biking trails as part of an exceptional trail system. This network connects with Denver trails and the foothills of the Rocky Mountains. Any resident of Arvada is within a 10-minute walking distance to the closest park. Arvada comprises 31 principal neighborhoods and is Colorado’s eighth-largest neighborhood. Approximately 37 percent of homes are owned. Twelve percent of the residences were built after 2000 while the majority of real estate was constructed between 1970 and 1999. Homes appreciated significantly in 2016 with a median value of around $340,000. Approximately one-quarter of the population in Arvada rents homes. Want to see the latest Arvada housing market activity? Create a free custom market report for YOUR neighborhood or area!